Yes, it’s time for that annual ritual of looking back across the last twleve months as a way of steeling oneself for the onslaught of the upcoming year. I’ve done this for the last four years on this blog, starting in December 2007, one year after I decided, as a last resort, to self-publish The Best Laid Plans, and then in December 2008 and again in December 2009. So here we are reminiscing about 2010. In January, the manuscript for The High Road was completed and submitted to McClelland & Stewart and my editor Douglas Gibson. In February, The Best Laid Plans was named a Finalist for Canada Also Reads, the National Post‘s answer to CBC’s Canada Reads, and was defended by Andy Maize of the Skydiggers. In April, The Best Laid Plans was unveiled as the Waterloo Region’s 2010 selection for One Book, One Community. In September, The High Road was published (McClelland & Stewart), shipped to book stores across the country, and earned some wonderful reviews. In November, The Best Laid Plans was named one of the five finalists for the 10 anniversary edition of CBC’s Canada Reads to be defended by the incomparable Ali Velshi. See what I mean about feeling blessed? It was a truly wonderful year for which I am just so thankful. When I can draw my eyes away from the bright light that was 2010, the coming year looks inviting, even exciting. I have a raft of readings and appearances from Pelham to Banff, Grimsby to Ottawa, and Brantford to Hamilton. You name the town, and I’ll probably be there. As well, I’ve nearly finished the outline for the as yet to be named novel #3 (the working title is Making Space but it’s a long way from final). The outline is a big deal in my so-called “process.” When it’s done (in the next week or so I hope), the actual writing of the manuscript should take about eight months of weekends. I’m eager to get back in the writing mode. 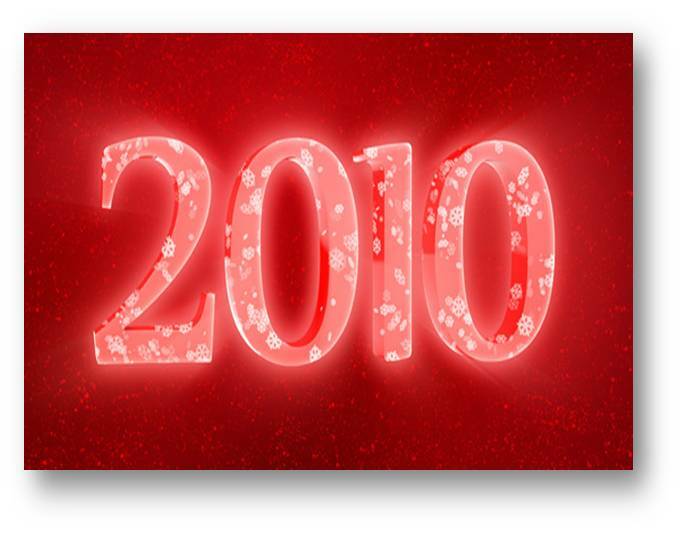 So farewell 2010, and thanks, it was amazing. Voting for Canada Also Reads opens! So VOTE! Vote early and vote often. But seriously, if you have a moment, head over to Canada Also Reads and register your vote. The polls are open until March 12th at 1:00. The winner will be announced on Monday, March 15th. Consider this to be part of your obligation as Canadians! Canlit needs your support! The essays in defence of the Canada Also Reads shortlisted books started yesterday. Two essays each day are posted on the National Post‘s Afterword blog. This afternoon, Andy Maize’s defence of The Best Laid Plans appeared. 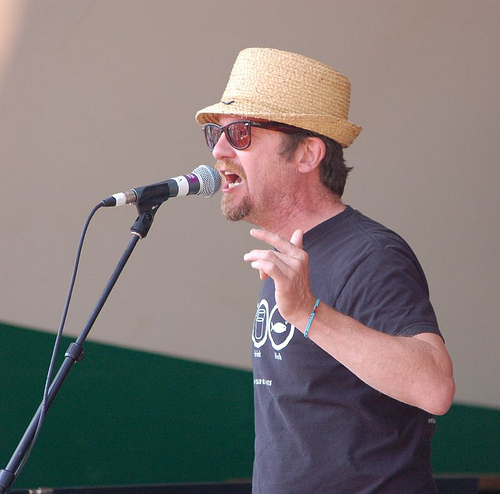 Andy Maize, co-founder and lead singer/songwriter with The Skydiggers has written a wonderful piece in support of TBLP. I love it and I’m grateful for the time, thought and care Andy clearly took in composing his essay. But it’s not over yet. 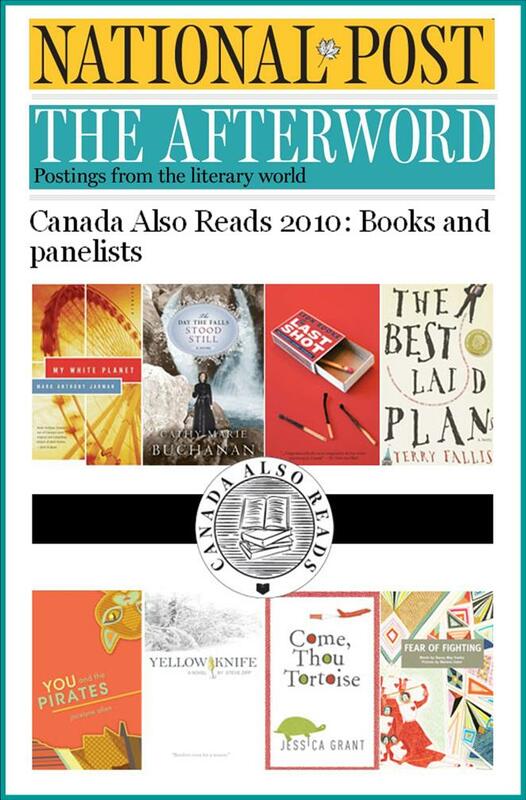 On Monday, March 8th, starting a 1:00 p.m., the National Post and Afterword blog will host an online chat with all of the panelists and authors. Should be fun. Then, Canadians will be able to vote online for the Canada Also Reads winner. Here’s hoping all of you loyal readers of this humble blog will cast your vote for TBLP when the time comes. 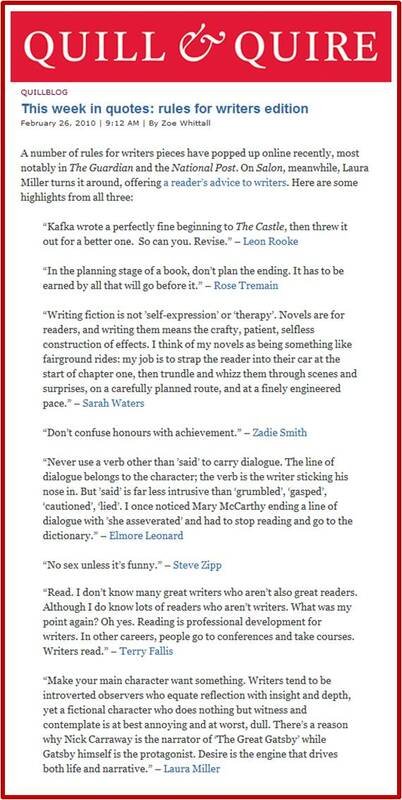 Taking a cue from the Guardian’s Rules for Writers series in the U.K., Brad Frenette, at the National Post and its Afterword blog, asked the authors of the eight shortlisted books for Canada Also Reads to submit their own fiction writing rules. 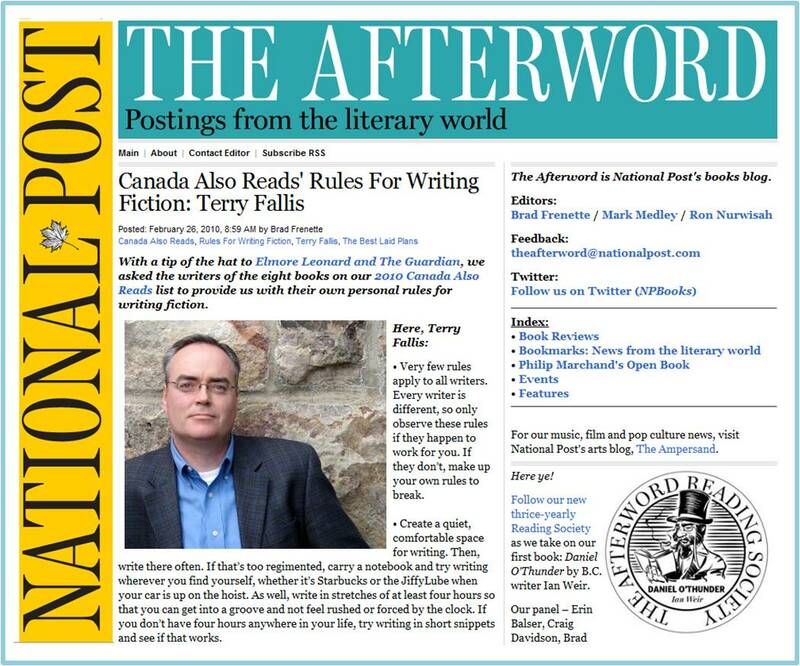 My contribution, hastily considered and created to meet the National Post’s deadline, appeared on the Afterword blog this morning. Who am I to be cooking up writing rules anyway. But I always try to do what I’m told. Very few rules apply to all writers. Every writer is different, so only observe these rules if they happen to work for you. If they donâ€™t, make up your own rules to break. Create a quiet, comfortable space for writing. Then, write there often. If thatâ€™s too regimented, carry a notebook and try writing wherever you find yourself, whether itâ€™s Starbucks or the JiffyLube when your car is up on the hoist. As well, write in stretches of at least four hours so that you can get into a groove and not feel rushed or forced by the clock. If you donâ€™t have four hours anywhere in your life, try writing in short snippets and see if that works. Iâ€™m an â€œoutlinerâ€ so I favour investing the time up front to map out a story in considerable detail. For writers with a fulltime job and not enough spare time for writing (like me! ), I find you can maximize efficiency if you know what happens and where youâ€™re going in each chapter. If that doesnâ€™t work, try starting with a blank page and follow where your story leads you. This seems to work for many writers, though itâ€™s a foreign concept to me. Worry less about finding an agent or publisher, and more about your manuscript. (I know, I know, easy for me to say.) But most agents will tell you itâ€™s really all about writing. Landing an agent and/or publisher will be easier if your manuscript is as good as it can be. When your manuscript is finished, for the first time, let it sit for a couple of weeks before you return to it. Time inflicts distance and perspective, which almost always inform and aid editing. Read your writing aloud. Youâ€™d be surprised how often I rearrange a sentence or choose a different word after hearing my writing, rather just looking at it. It was one of the benefits of podcasting my first novel before it was ever a book. Print out your manuscript-in-progress once in a while. Itâ€™s easier to read it, and the growing stack of paper provides a sense of progress and satisfaction that can help you through the home stretch. Visualize the scenes youâ€™re writing as if youâ€™re a movie director. This will add realism to your words, and help you decide what to describe and what not to. If it helps, go ahead and cast major stars as the main characters so you can see them in your mind. I know this seems like a drag and may appear to contradict Rule #5 above, but when your book is written, commit as much effort to promoting your book as you did to writing it. Build an audience by using the online tools to which we all now have ready access, like podcasting and blogging. Offer to do readings at libraries and book clubs. Enter your book in competitions and awards. Sit on panels. Get out there, even if itâ€™s uncomfortable. Publishers like it when you do this because you sell more books. And, you get better at it with practice. You might even come to enjoy it. I know I have. 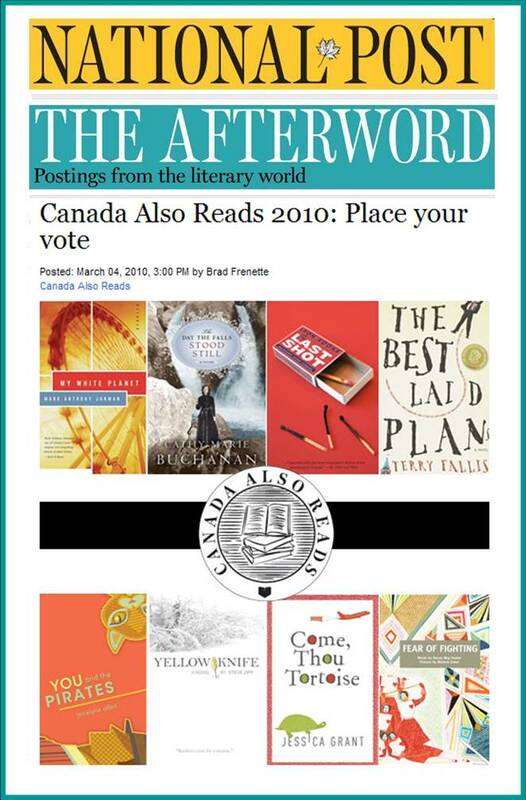 On Monday, March 1, the essays defending each of the Canada Also Reads finalists begin. TBLP is being defended by singer/songwriter and all-round great guy, Andy Maize of the Skydiggers. I’m not sure which day his essay will run but you can bet it will commemorated on this humble blog. You may recall a blog post I wrote at the end of December about being long-listed for the National Post’s Canada Also Reads competition. I was really happy to be among the more than 60 books on the list. So imagine my delight late this afternoon at finding The Best Laid Plans on the shortlist. What’s more, my old friend, Andy Maize, co-founder and lead singer of the great Canadian roots rock band the Skydiggers has agreed to defend the novel in the competition. I’ve known Andy for more than 25 years. He was the lead singer in our band at McMaster University. He was by the far the best of us, as his subsequent music career illustrates. I’m looking forward to reconnecting with Andy. Starting on March 1st, the defenders will author articles about their designated books, extolling their virtues and urging Canadians to read them. There will also be a live online chat with the authors and defenders in early March. Finally, Canadians will vote for their favourite. So there will be a role for all of you in making sure TBLP has a good showing! There are some wonderful books in the running including Cathy Marie Buchanan’s The Day the Falls Stood Still, so check them out. I’m over the moon that TBLP is a finalist. This is wonderful news, particularly with The High Road being published in September. Stay tuned and get ready to vote!